The fall season may be upon us, but it doesn’t mean that you have to put away your grill just yet. This recipe pairs marinated steak with mushrooms and onions to bring you a steakhouse experience on the grill. It also makes a perfect combination when paired with a glass of our Blended Red. Whisk together oil, Worcestershire, soy sauce, lemon juice, mustard, garlic, brown sugar, and black pepper in a small bowl. Place beef cubes and mushrooms in a large resealable plastic bag. Add marinade and seal bag, pressing out as much air as possible. Marinate, refrigerated, for at least 1 and up to 5 hours. 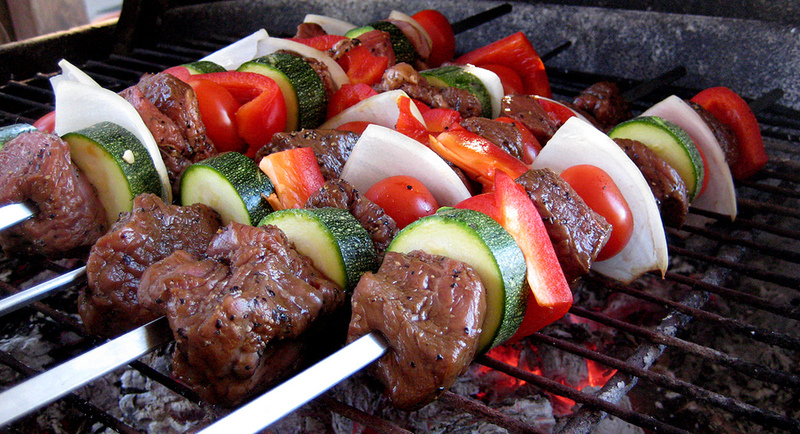 Thread beef onto skewers, alternating with the mushrooms and onions (feel free to add other veggies if you choose!). Light one chimney full of charcoal. When all charcoal is lit and covered with grey ash, pour out and spread the coals evenly over entire surface of coal grate. Set cooking grate in place, cover grill and allow to preheat for 5 minutes. Clean and oil the grilling grate. Grill skewers until beef is well seared on all sides and centre of beef registers between 125-130°F on an instant read thermometer, about 3 minutes per side. Transfer skewers to platter and let rest for 5 minutes. Serve immediately along with a glass of our Blended Red wine. Find the original recipe here. © 2015 Generations Wine Company Ltd.